It’s always fun to capture the magic of a school show for posterity. With these easy steps, you’ll learn how to record a school play with your camcorder and make a memorable recording. 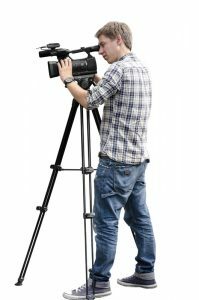 Beg for, borrow or buy a tripod for your camcorder. This will help you get good, steady shots. Pick out an area towards the back centre of the audience area. This should give you the best view of the entire performing area, and it will lessen your chances of having a large hairdo or other visual disturbance blocking your view. Ensure you have ample video tapes or memory cards and batteries. If possible plug the camera into a mains socket. Set up your tripod and camcorder. Record a little bit of footage and play it back to see if you are getting the picture that you want. This will also give you an idea of how the sound is picked up, and whether you need to increase or decrease the recording volume. When filming, zoom and pan slowly and smoothly. Fast zooming or constant panning will make your audience sea-sick. Try to include close ups of all the performers who appear in the school show. Exposure: Stage lighting often confuses camcorders’ automatic exposure systems. The dark stage background fools the camera into overexposing the parts of the picture that you really want to see, like peoples’ faces. To overcome this, review your camcorder operating instructions to figure out how the manual exposure settings work. Some cameras may have special automatic exposure settings specifically designed for “spotlight” type situations. It often helps to view the video picture on a small television screen while filming. Focus: Today’s cameras also have automatic focus. Great stuff, but autofocus also tends to be confused by stage lighting. Your camera will sit there trying to figure out what to focus on before the lights come up, and it will get it wrong, so that when the lights do come up you have a fuzzy image till it makes a better guess. Review the other section of your camera instructions to figure out how the manual focusing works. For a start, zoom in and focus on the curtain or part of the scenery using room lighting before action starts. Video cameras should maintain focus when changing zoom settings. If you’re relatively far back from the stage and the stage is relatively shallow, you can probably just leave it at that setting. Otherwise, know which direction of which knob moves closer or further away, and get a feel for how fast the focal distance changes. Use your printed programme to determine where they may be a interval or pause in the performance, and be ready to pause or stop the recording just as the applause ends and before the lights come up. Once the performance has finished, protect the tape from over-recording by sliding the tab on the side of the tape. Keep the tape in its case when not in use. Send your master tape to Wizard so we can produce your DVD copies of your school show for pupils and their family and friends.